Up until this point, Trump’s track record on climate change has been disastrous. 45 himself has called global warming a “hoax” and implied that “nobody really knows” if climate change is real. His Environmental Protection Agency (EPA) Secretary said he doesn’t believe in man-made climate change and deleted mentions of climate change from agency websites. In June, Trump pulled out of the Paris Climate Agreement, leaving the United States as the only country in the world not part of the climate pact. In October, his administration repealed the Clean Power Plan, an Obama-era effort that required the U.S. to reduce its carbon emissions. And if all that isn’t enough, while the rest of the world focused on reaching its shared greenhouse gas reduction goals at the United Nations climate talks last month, the U.S. delegation promoted fossil fuels. Many countries will encounter climate-induced disruptions—such as weather-related disasters, drought, famine, or damage to infrastructure—that stress their capacity to respond, cope with, or adapt. Climate-related impacts will also contribute to increased migration, which can be particularly disruptive if, for example, demand for food and shelter outstrips the resources available to assist those in need. The intelligence officials and military officers cited in section 335 of the bill “found that climate instability will lead to instability in geopolitics and impact American military operations around the world.” But there is no mention of U.S. policies that contributed to climate-related instability, including migration, civil conflict, and poverty. There is no recognition of the fact that the United States’ continued refusal to acknowledge the dangers of fossil fuels further exacerbates environmental problems in the Global South. 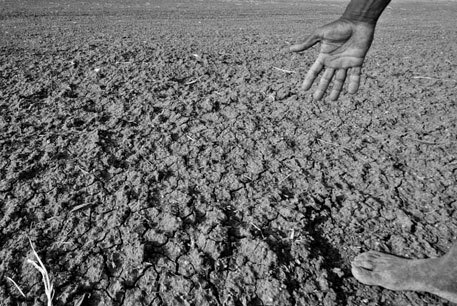 While the report suggests that climate change related droughts and famines will lead to “more failed states, which are breeding grounds of extremist and terrorist organizations,” there is no mention of the ways the National Defense Authorization Act itself and U.S.-led military occupation, invasion, and aggression creates “failed states” and destroys families and communities. As I was writing this, the Trump administration announced it will drop climate change from a list of global threats. The Guardian reports this marks a shift away from the Obama administration’s approach, which identified climate change as one of the main threats facing the US. This is important for two reasons: first, Trump isn’t the first to weaponize climate change for militaristic reasons (Obama did this too!). Second, it’s a reminder 45 will contradict himself and backpedal on issues without thinking twice, as long as it serves his interests. We have to remain vigilant and keep a watch on the ways Trump both weaponizes and denies climate change to justify state-sponsored violence and military aggression abroad and domestically. To be clear: for Trump, this isn’t an environmental justice or human rights issue. It’s an invitation to further militarize our borders, intervene in the Global South, and stop the flow of migrants to the United States. In signing the National Defense Authorization Act, the administration has finally acknowledged that climate change is real and urgent—but with significant costs. It’s crucial that climate change activists (looking at you, white people) reject this framing, even if it comes with money, resources, and government acceptance. Just as women of color have challenged the colorblind rhetoric of white feminism and Black queer folks have called out the marriage equality campaign for its erasure of life-and-death issues they face daily, it’s important that those of us committed to climate justice reject Trump’s strategy. Using a national security framework to call for climate justice is a failed, racist, and xenophobic strategy. 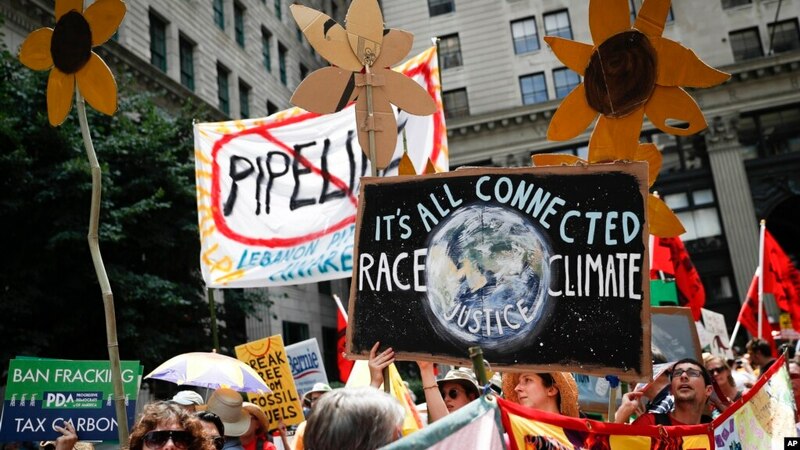 In fighting for climate justice, let’s reject this approach and rather, link climate justice to struggles for indigenous sovereignty, anti-imperialism, and racial justice. The more privileged residents of the Global North have a strange sense of time. Even as the storms get fiercer and the forest fires burn, climate change is often seen as the reality of a cataclysmic future. In the past month, at least four prominent undocumented immigrant activists and community leaders have been detained by Immigration and Customs Enforcement (ICE). The timing of these arrests is no coincidence: this is a strategic and retaliatory move by the Trump administration meant to silence movement leaders and dissuade others from engaging in political work. 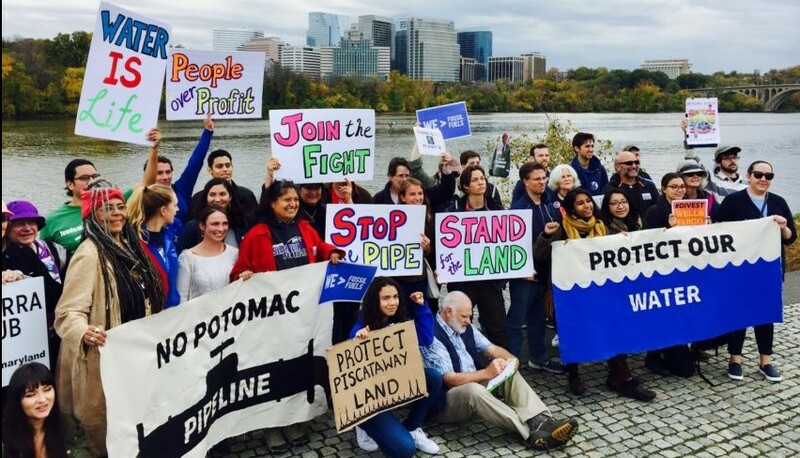 Tomorrow, the Maryland Department of the Environment will hold a public hearing on the “Potomac Pipeline,” a gas pipeline extension that would put the drinking water of millions of people at risk. A women-led, grassroots movement is urgently organizing to stop it.